1957: Birth at Berlin, Germany. 1975 - 77: Vocational training as computer programmer. 1979 - 98: Employment as computer programmer at Technical University of Berlin. 1983 - dato: Extensive travels to India. 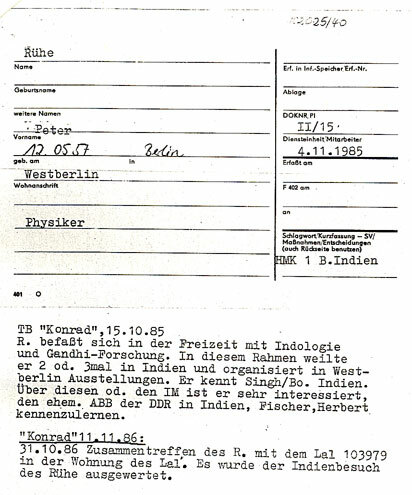 1983: Involvement in German peace movement; Establishment of Gandhi Information Center, Berlin (chairperson from 1983 to 1992). 1984: First major exhibition on the life and work of Mahatma Gandhi in Berlin. Co-author of the book My Life Is My Message - Das Leben and Wirken von M.K. Gandhi (German). 1985: Prabhudas Gandhi becomes mentor and friend. Adviser to ORF (Austrian TV) for a TV program on Gandhi, Mirabehn, the Chipko movement, and ecology in the Himalaya region (Bäume umarmen - Hugging Trees). 1987: Leading first group tour In the Footsteps of Mahatma Gandhi to India. Major exhibition on the life and work of Mahatma Gandhi in Israel. Adviser to ZDF/3SAT (German TV) for a 3-hours TV programme on Gandhi. 1988: Preparation of an extensive photo archive on Gandhi and India's independence movement (until 1994). Consultant to ZDF (German TV) for a TV quiz on Gandhi. 1991: Organised an annual drawing competition Mahatma Gandhi - As I See Him in Rajkot (Gujarat/India). Establishment and promotion of the International youth project The Gandhi Bridge of Understanding. 1992: Award for his life work by the Gujarati Writers' Association, Rajkot. 1996: Award Photographer of the Year by Dinodia Picture Agency, Mumbai. 1997: Director research for a documentary TV serial on Gandhi directed by Ketan Mehta, Mumbai. 1998: Direction and production of the audio visual show NAMASTÉ- A Journey Across India Following The Footprints Of Mahatma Gandhi in Hindi , English and German language. Establishment of the not-for-profit company GandhiServe e.K. in Germany. 1998 - dato: Design and administration of the most extensive web site on Mahatma Gandhi, GandhiServe's Mahatma Gandhi Research and Media Service . 1999: Promotion of Search-n-Research in India, a countrywide project for the identification and conservation of original material on and by Mahatma Gandhi. 2001: Initiation and coordination of GandhiServe's Earthquake Relief Campaign in Gujarat. Author of the photo biography Gandhi, published by Phaidon Press, London/New York. 2002: Establishment of the charitable GandhiServe Foundation in Berlin, Germany. Organization of various events. 2003: Consultant to the theater play SAMMY! - The Word That Broke An Empire. Organization of various events. 2004: Consultant to the BBC TV documentary The World's Most Photographed - Mahatma Gandhi. Organization of various events. 2005: Consultant to the feature film Gandhi My Father. Organization of various events. 2006: Meeting with Indian Prime Minister, Dr. Manmohan Singh. Organization of various events. 2007: Consultant to Gandhi the musical. Organization of various events. 2008: Organization of various events. 2009: Creation of GandhiTopia, a Gandhian social network. Organization of various events. 2010: Assistance with establishment of sister organization GandhiServe India. Organization of various events. 2011: Planning, design and production of GandhiMedia, GandhiServe's digital media archive. Organization of various events. 2012: Lauch of GandhiMedia. Organization of various events. 2013: Establishment as Medical Tourism Specialist and co-developer of healing travel programme. Launch of Berlindo International (from 2015: Ruehe Healthcare), a company for im/export of ayurvedic products. Organization of various events. 2014: Design and launch of the website The Gandhi Collection Organization of various events. 2015: Launch of an ebay store and of the GandhiServe Store Organization of various events.